When you are a member, chair, or secretary of a committee you can send emails to the other committee members. 1. To email committee members, you must go to your district's website and log in. Then, click on Member Area on the top right, under your club banner. 2. Along the top of the screen you will see several tabs. Click on the For Members tab. 3. Next, click My Committees link. 4. You are now on the My Committees page. Here, you can view the details of your committees. 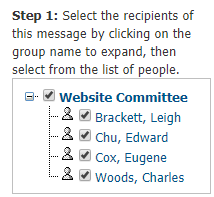 In order to email the members of a given committee, click on the committee's name in the list. Note: If you are not a member of any committees, you will be unable to continue with this guide. 5. Next, click on the tab labelled Email. 6. You are now on the Committee Email page. Here, you can view all committee email sent within the last three months, if any. To compose a new email, click the Compose New Message link. 7. Now, you can determine the recipients of the email and also define its content. 8. First, determine which committee members will receive the message using the checkboxes provided. If you click next to the name of the committee, it will choose all committee members. 9. Next, enter the subject of your email in the text field provided. 10. 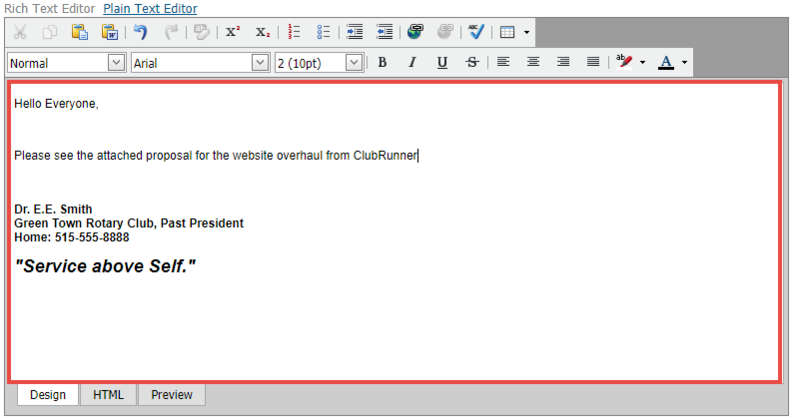 Now, enter the text of the email in using the editing tools provided. 11. You have the option to attach a file to the emaill, such as a document or map. If you click on the highlighted link, you will be asked to choose a file from your hard drive. You may also choose to send the list of recipients as an additional attachment, and copy yourself on the email, using the checkboxes provided. Note: All email messages have a size limit of six megabytes. 12. Finally, if you don't wish to send your email immediately, you may choose to schedule a time and day for delivery. Simply enter the time and date using the fields provided. Send: Send the email to the selected members immediately. Save as Draft: Save the email for later editing. Send Test Email to Myself Only: This option allows you to preview the email before sending a final copy.